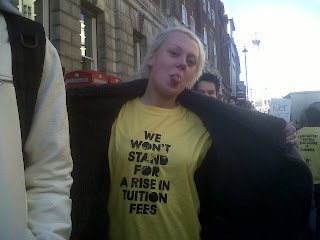 Student protests across the country have finally made government officials think twice about the rise in tuition fees. Worry has broken out for not just for students, but for A-Level lectures. There may be many decisions the government make that we don’t agree with, but, the rise in tuition fees is something that hasn’t gone down very well with students all over country. Last month up to 50,000 students from all over the UK united to make a stand against the rise in tuition fees. The demolition on the 10.11.10 through the centre of London was set up by the National Union of Students (NUS) and the University and college union (UCU). The government’s plan to raise tuition fees means allowing some universities to charge up to £9,000 – currently students pay £3,290 pounds a year, the major worry is that socially everyone will not be entitled to a chance of free education and making it more about the individual. London is not the only place that students have protested against the rise in tuition fees. Protests have been going on in recent weeks all over the country with thousands of students making a stand in hope that the government will listen. There have been mass walk outs, sit ins, some students closed access to the Old School office which is home to the vice-chancellor's office and finance office in Cambridge last month. Suzanne Cunning a student from the University of central Birmingham said “By students protesting across the country it is making people and more importantly the government realise just how badly we feel about it, the people really have spoken and this is something we just won’t stand for. We have been promised something completely different to what is happening”. With this being the biggest student protest in over a decade many students are hopeful that this will make a difference Suzanne went on to say “we won’t give up, that’s for sure!”. As the potential increase is not due to take place until 2012, it’s more a worry for A level students and also lecture’s preparing future university students. A lot of people that are currently in University won’t actually be affected but there are lots of fears for college students. With debts up to £30,000 plus, if the increase does go up to £9,000 this will hold back thousands of students that have the qualifications but primarily funding is the initial problem. The spending review announced that there could be cuts of up to 40% by the end of 2010 but it’s said that teaching funds will face bigger cuts then 40%. There are some university’s that will be able to increase there’s fees allowing them to increase their funding regardless to the budget cuts. The problem college lectures now fear some people not going on to study at college due to the fact some students know they won’t be able to pursue any further. This is instigated fear into teachers of further education. Questions have been raised as to whether people now will not want to receive further education from A-Levels and leave school just to go straight into work. She went on to say “Now students will be looking for apprenticeships or just go straight into work. It’s definitely having an impact on numbers in getting students in to do A-Levels in the first place, because what’s the point if I’m not going to university”. Nicola has said she has many students that know what they want, have the qualification and know what course they would like to do they just have the support financially. New government plans mean that up to 18,000 students may be able to get their first two years of study paid for according to universities minister David Willets. Following the past few weeks it has seemed that the government would have to do something to insure there are equal opportunities to all. This is what the government have come up with. Ministers believe that this could benefit poorer children and able all classes the right to education. With a very mixed and controversial reaction to the government’s plans and with thousands of students across the country against the plans – many education officials will have to re-think their plans, we as a nation can understand that in a recession we will understandably have to go through cuts backs, but is it right that some people will miss out on opportunities that in the long run could actually benefit our climate? Or it will ensure that the most determined and academically able students will get places meaning there will be a higher level of more qualified professionals? Ashlee Louise Dillon. Awesome Inc. theme. Theme images by kellykellykelly. Powered by Blogger.